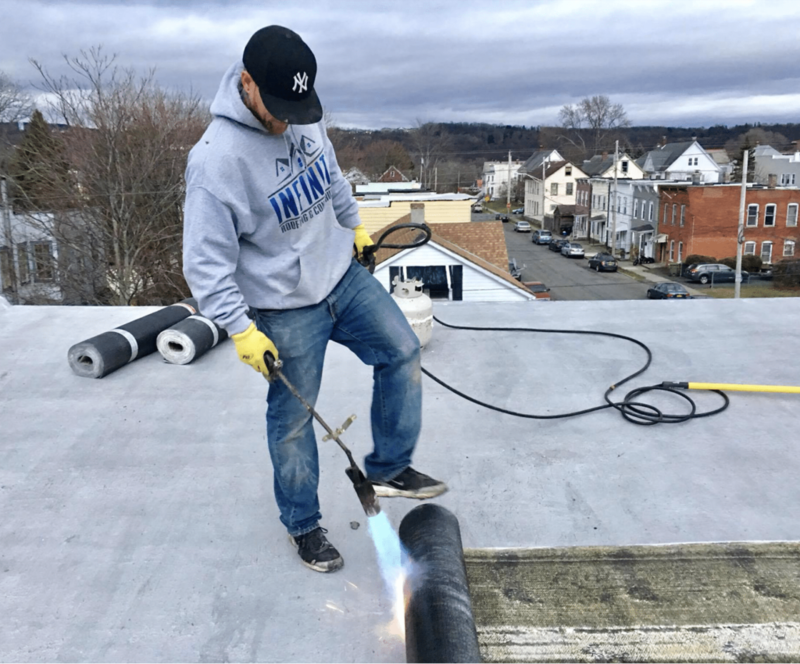 Roof Replacements in Albany come with a 10 year labor/materials warranty & up to 50 year manufacturers warranty. Premium Materials Used, Certified by IKO, GAF, Certainteed, James Hardie & More. Company Provided Construction Protection Preventing Damage To Your Valuables. Clean-up Guaranteed: No nails, debris or damage after we’re done. Upon getting a major leak in my house. I needed a new roof. Hunter and Infinite Roofing was not the first estimate, but he was the last. Friday, Infinite showed up at 8:00am and were done by 2:00pm. Not only does the new roof look wonderful, the Infinite Roofing crew cleaned every speck of the old roof from my yard and deck. 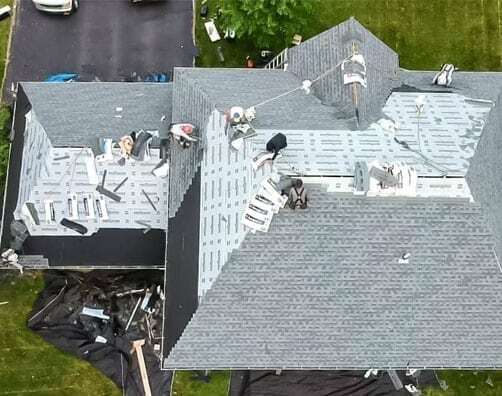 From the estimate to completion, Infinite was easy to work with, and along with the roof, pulled out 2 leaky skylights, installed new plywood and support structure at no additional cost. They also trimmed the trees around the house. Replacements and repairs for the flat roofs, steep roofs and shingles common to New York’s capital. Custom vinyl siding installed and certified by Certainteed to match your desired aesthetic for your home. Albany: New York state’s prestigious capital with a rich history dating back to the original dutch colonists in 1614, and one of the oldest surviving settlements from the original 13 colonies under British rule. In fact - Albany has the honor of being the longest continuously chartered city in all of the USA! We’ve been long-time leaders of industry: from some of the world’s first railroads, the eastern end point of the Erie Canal, and lately the explosion in tech following the new nano center. To that end, much of our city’s great original architecture remains intact today. Infinite Roofing and Construction as a company and as contractors has been proud to call Albany it’s capital of operations and to this day we help Albany clients deal with the unique challenges of humid summers, cold and snowy winters and preserving the old architectural integrity of the classic steep roofs and flat roofs so common throughout downtown and surrounding areas. Property Managers, Home Owners and Businesses have trusted Infinite Roofing to reliably and consistently reinvigorate their roofing and siding for 20 years in the region. Roofing material that preserves Albany's unique historic architecture. As a resident of Albany, you know that it’s not just about doing a quick roof replacement job, it’s about maintaining the architectural aesthetic and carefully preserving a 400 year old heritage. Most roofing companies aren’t equipped to handle more than what you’d call a 5 pitch ‘walker’ roof. However, the team at Infinite has specialized in handling the steeper pitches of the average shingle roof in the area and has been professionally handling flat roofs for residential clients, companies like starbucks and local credit unions and more. Maintaining historic style aesthetics doesn’t have to mean that the cost goes up incredibly, whether it’s replacing a roof or doing roof repair, we’ll be able to come in and give you a reasonable price, backed up by manufacturer certifications by GAF, IKO and Owens Corning and Certainteed. In fact, many Albany residents choose IKO over GAF to have the flexibility of budget to handle the extra roof pitch that comes common to the area. If you have a flat roof, you’re going to want to look into our EPDM roofing services to properly take care of your home and protect ventilation systems already in place. When you partially or completely replace a roof, we’ll guarantee the work for 10 years. Plus, we’ll stack additional warranties from the manufacturers on all work. We’re certified by IKO, GAF, Certainteed and Owens Corning. Get matching gutters to your new roof while we’re out working and save on costly labor prices of separate installations. Seamless Gutters don’t have to stand out - with color matching technology we’re able to blend them right in with the overall aesthetic of your home. EPDM, TPO and other styles of flat roofing come with their own unique set of challenges and not every roof contractor is equipped to handle the differences. We’ve done work for major corporations like Starbucks, local banks and residential and have a proven track record of success. Many homes in the area were originally built with slate roofs that are now reaching the end of their lifespan, and are in need of roof replacement. Many are approaching 85 or 100 years old now! Most of the homes built 100 years ago still have their original “forever roofs,” and almost all of them are using slate. However, that also means that the time has come where they have to be replaced. We do offer full slate roofing services, however, if a new slate roof is not what you want or is not in your budget, then we can offer slate roof removal services and replace the old slate with new asphalt shingles from GAF, IKO or Certainteed. If you look in the attic for the spacing between the decking planks, if your spacing is a half inch or greater, then you’re going to have to put plywood decking over the original wood decking (or have the wood decking removed entirely). If you don’t have any spacing between the planks, if its “tongue and groove” for example, then you won’t need any new decking and shingles can be placed directly on top of it. *Same as cash financing on 0% option. Want to investigate Financing? YES! We have Roof Financing available for Albany. Unexpected roof expenses don’t exactly create a lot of excitement for people, and oftentimes the spare $6,000, $10,000 or $20,000 simply isn’t available to make the needed replacements on your roof. That’s why we’ve partnered with key vendors for years in order to guarantee you access to funding, at the best rate possible, without using your home as equity in the deal. One Main Financial offers a lower rate and is best for average and above credit scores. You can have them finance either the full cost or a partial cost to your roof so you get exactly the level of commitment you need to get your project to be a smashing success. 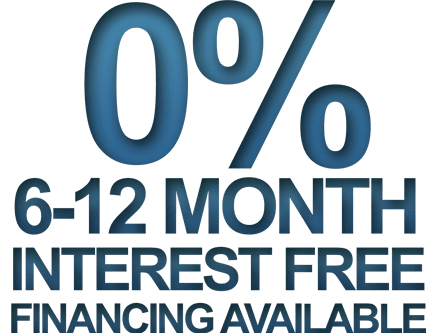 Foundation Finance opens up approval to all credit tiers plus, for higher scores offers 12 month same as cash financing with no interest if paid off in 12 months. We’d encourage you to look at whichever option is best for you. 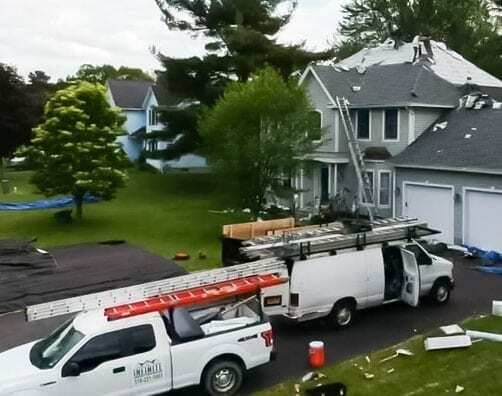 Additionally, if your roof has been damaged by a recent storm, as is common around Albany, your insurance may cover the costs of replacement or repair. You will want to look at our residential roofing page for more details and a guide on getting insurance to pay for it all. Most homeowners want gutters that aren’t going to create a lot of long-term maintenance problems. That’s why we’ve partnered with Xtreme Gutter Guards to not only be able to precisely match the coloring of the system with your roof and siding, but also so that you don’t have to worry about clogging gutters ever again. Every Xtreme Gutter installation comes packed with a 20 year warranty, manufactured with a patented design that keeps the water flowing where it should (down the gutter) while all the other stuff (leaves, pests, twigs, snow) doesn’t get in. Vinyl siding doesn’t have to look like vinyl. Certainteed’s options provide great color, while matching the organic appearance of wood and lasting much longer! However, if you’re home is in a historic neighborhood or district, then you will need to opt for James Hardie fiber cement siding to match the original aesthetic. In historic districts, homes and businesses cannot use vinyl or j-channel siding. Make sure the contractor you’re hiring is certified by Certainteed and James Hardie for your specific type of installation. Infinite Roofing is fully certified by both companies and all of our crew members are trained and able to provide guaranteed work on all siding installations. In other words, we’re able to get it done right the first time, rather than you having to deal with incorrect installations problems.